Ingenico ePayments, the online and mobile commerce division of Ingenico Group, has been announced as the winner of the eCommerce Awards Best Mobile eCommerce Campaign for its work with global burger restaurant Five Guys. Supported by Lineten’s NOQU and live from January 2017, the Ingenico ePayments solution provides a scalable, secure ePayment gateway that enables Five Guys customers to shop securely from mobile, tablet or laptop. The win follows Ingenico ePayments’ success at the 2016 eCommerce Awards, where it won Best Cross Border eCommerce Campaign for its work helping UK-based business Euro Car Parts expand overseas, supported by a full-service range of localised payment products. The eCommerce Awards, now in its ninth year, has consistently broken new ground in highlighting some of the very best online retailers, online companies, agencies, innovations, products and campaigns the ecommerce industry has to offer. 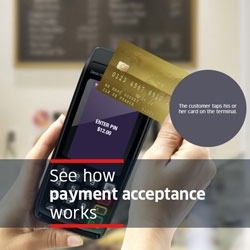 At a ceremony in London Marriott Hotel Grosvenor Square, Ingenico and Five Guys were recognised for their pioneering digital collaboration, embracing the way today’s discerning consumer wants convenience and security at their fingertips. The judging panel, including representatives from Google, the IMRG, and Amazon, recognised the growth opportunities enabled by Ingenico’s payment integration, allowing Five Guys to adapt to local preferences. As a result of the technology partnership, Five Guys customers visiting flagship restaurants in Paris and Madrid can now pre-order and pre-pay for food, progressing directly to the pick-up point for collection. Ingenico’s system accepts multiple currencies and payment types as well as a choice of language support options. Five Guys has also been able to use the gateway with its chosen local acquirers. The partnership with ingenico ePayments has allowed Five Guys to start planning for the next phase of its expansion in France, Spain and beyond.